Much as I love the Beautiful Game, I’d be the first to admit that football has been driving me to furious distraction recently – and that’s nothing to do with events on the pitch. The English game has shown its nastiest, most venal and bigoted side in recent seasons; with racism, sexual violence and abject greed rearing their ugly heads in a sport that really should, you would think, know so much better than all that. Football, wherein is nothing but beastly fury and extreme violence, whereof proceedeth hurt, and consequently rancour and malice do remain with them that be wounded. Elyot’s sometime boss Henry VIII certainly owned a pair of football boots and may possibly have played too, but he actually went as far as to ban the sport in 1548 for inciting riots – the possibility of those darn peasants revolting again was a risk the Tudor authorities were not prepared to take. Rules in football… vary from place to place and from match to match. There is no offside rule – or any other rule for that matter. 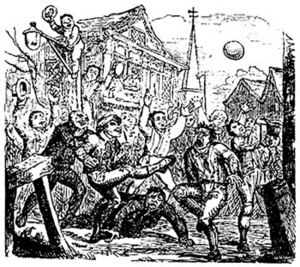 For much of the [14th] century the only law relating to football is the one banning it. In 1314 the Mayor London forbids the game being played anywhere near the city [Can you imagine Boris trying that now!? – Ed.]. Edward III bans it throughout the kingdom in 1331, and again in 1363. It creates a lot of noise. It distracts people from practising their archery. It results in damage to property and crops; many people are injured and some are killed. The case of William de Spalding is perhaps the most famous. In 1321 William petitions the pope for an indulgence on account of the fact that, during a game of football, a friend of his died from running into him so hard that his knife went through its sheath and into his friend. Just as scandalous and bad-tempered as today, then. But interesting, in that it all shows how much of a threat to the status quo medieval football was perceived to be (whether it really was – or not – is another matter). The fact that the game was banned on at least three separate occasions by two separate monarchs more than two centuries apart suggests that it was seen as a problem – a problem that might threaten medieval society (and their place in it) if they weren’t careful. When you compare the medieval game with its modern counterpart, it soon becomes obvious that its place in the greater scheme of things has shifted from basically being outlawed by a society and establishment that feared rebellion from below to becoming part of that society – even part of the status quo that it once threatened, what with often dubious billionaire owners, flawed players held up as role models for young people, and massive television deals with media companies who have bought themselves political and (to a greater or lesser extent) cultural clout. It is in that sense that football has changed most dramatically – from being a medieval establishment-threatening and outlawed ‘other’ at the bottom of society to becoming part of the fabric of that society to an increasingly powerful extent. The game would appear to have changed almost beyond recognition to a time-travelling 14th century player, but it is interesting to note that the same social problems and behavioural complaints that he would probably recognise still remain associated with this sport, all these centuries later. Football – medieval style – even more violent than today! They mean the other football fellow Americans…..